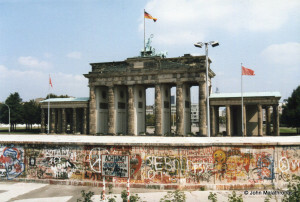 In late August 1989 I went to Berlin and took this pic. I was amazed at how low The Wall was and how close to it you could get. It’s on the other side, of course, you couldn’t go anywhere near. 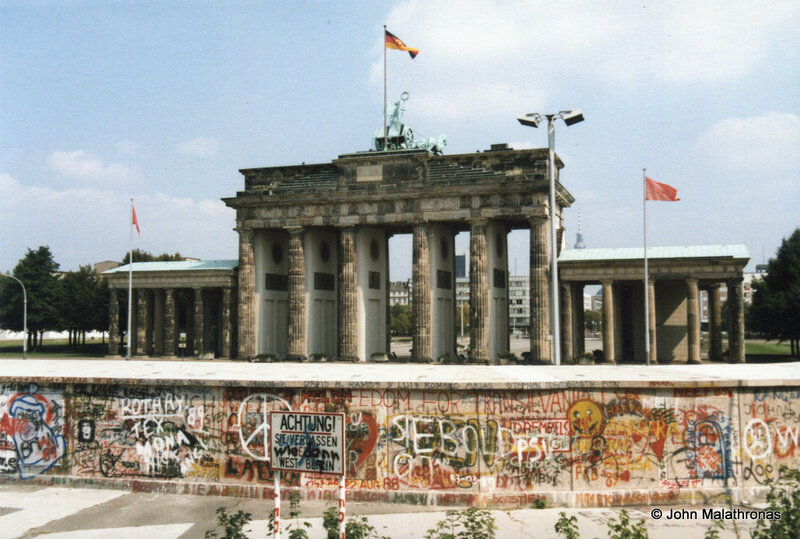 I have written elsewhere about the day I spent in East Berlin, in through CheckPoint Charlie, out of the Friedrichstrasse. The only part of East Germany’s culture remaining in Berlin are the Ampelmännchen. Three months later, on 9 November 1989 I had a cycle accident in Clerkenwell, in London travelling to work. I was going on a straight line but a car on the opposite lane wanting to turn left did so right when I was in front of it. It hadn’t seen me. There was an ambulance strike in London at the time and I was left out cold for 20 minutes. Thankfully I was wearing a helmet. At the hospital they decided that nothing broke but that my spine was distorted and was pressing on nerve endings. Having a good work health insurance I was to have three-times-a-week sessions for nine-months with Princess Diana’s personal physio off Harley Street. He told me that she grew tall quickly as a teenager and was suffering from backpain. Once one of my appointments was postponed because, as I found afterwards, she’s fallen down the stairs in one of her suicide attempts. The car that hit me admitted responsibility and I received £2000 in compensation. My front wheel needed changing but I still have that bike. I haven’t ridden it in London since, though. And I have been left with a slight spine scoliosis; a twist you can see if you ever come swimming with me. A year later, I resigned from my job. The frequent sessions at the physio rankled with management. They couldn’t sack me but they made sure any prospects were blocked. And yes, that was also the day the Wall fell. The whole day of the accident is a blur as I spent it in hospital with concussion. When I arrived home, I slept and only at 10pm did I decide to turn the TV on. It was the news. I saw people tearing down The Wall. I remember my first reaction. I looked at the pills they’d given me.